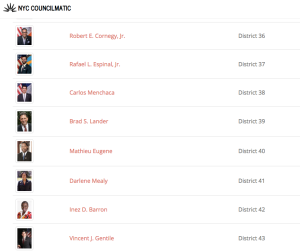 NYC Councilmatic is live, and ready for public discussion about local issues. Starting December 1st, we’ll bring together a monthly public comment program on community issues in NYC and how they relate to legislative activity. 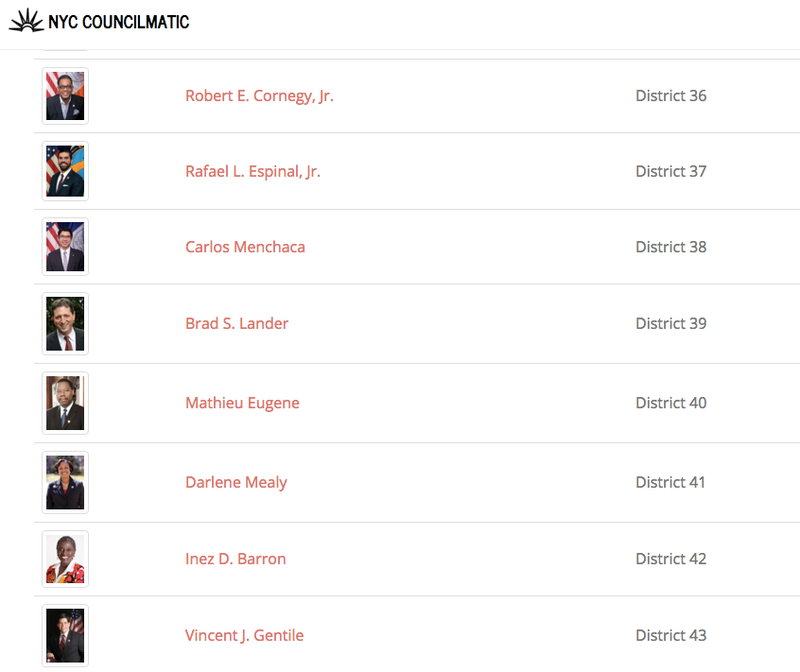 NYC Council members listing – all 51 offices are invited to be verified. All NYC Council offices, neighborhood groups, issue organizations and regional media can get “verified” on Councilmatic – at no cost, and with no contract. It’s a volunteer add-on, to increase public awareness of city council activities. NYC Council offices: to become verified, simply email me: david@ppolitics.org, or ‘direct message’ me on Twitter, @ppolitics. Verified offices agree to spend at least one staff hour per month responding to public comments on Councilmatic. We’ll briefly confirm that the email comes from a council staff person, and then we’ll mark the council member as “verified” throughout the site – no other steps required at this point, just dashing off an email gets it done. More info below for government offices. Community groups: we’re excited to feature your comments on Councilmatic pages and deliver your group’s feedback to city council offices for a public response. 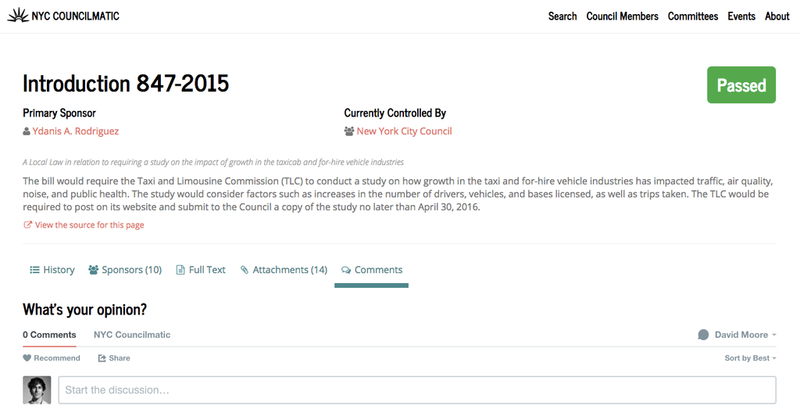 Here’s how to comment on Councilmatic, such as on the 2015 “Uber bill” (to study for-hire vehicles in NYC) featured on our homepage. 1. Visit the page of any legislative item on Councilmatic , and click on the comments tab (see below). Search for keywords you’re tracking, or from your council member, etc. – we’re happy to help, get in touch. 2. Enter your comment in the top box and then go through one of the options below – login with one of the social media options, or sign up with Disqus with an email and new password. 3. If you click a social media button, e.g. 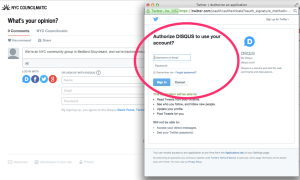 for Twitter, Disqus will simply bring over the avatar from your Twitter account (the one logged-in in your browser). You’ll briefly register your new Disqus account in a pop-up window, with your email and password. Or, if you use a new email, you can set an avatar of your choice, of course. 4. Once your Disqus account is registered, your comment will be pending. Councilmatic site admins will be notified over email that your comment is awaiting moderator review, and we’ll publish it right away. If not, ping us to let us know! 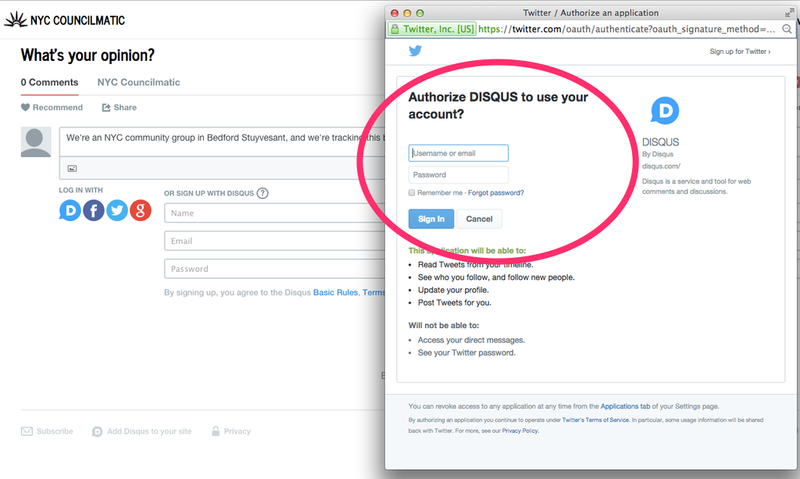 Groups are free to register more than one account on Disqus – for example, one using your organization’s Twitter name, or one using your personal Twitter account, or both. We’re happy to help with questions along the way, takes just a minute – contact us with questions. Both accounts could post comments on bills Councilmatic, that would be great. NYC media: we seek to surface more public info on what’s trending in city council districts and continual conversations with elected officials (and their offices). For now, follow the same instructions as above for community groups. In the future we’ll develop more open-data offerings and widgets about NYC government to embed on your pages. Comments from Council offices, community groups and users go here, on NYC legislation pages. More info for NYC Council offices: “Verified” council offices simply agree to allocate one staff hour per month on Councilmatic, responding to user comments on a featured legislative topic, or an issue in the news. The council staff person handling the comments can be from communications, legislative, scheduling, social media, or other department. He or she can be directly assisted by Councilmatic staff, for ease of use. 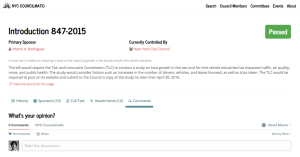 Verified NYC Council partners will be able to select monthly discussion topics to promote – and in the future, connect with more of their constituents through NYC Councilmatic. Coming next, we’ll have comment forums for committee activity (which affects issues such as public housing, education, immigration) and for events (such as individual committee hearings and stated meetings of the full council). Questions & feedback welcome, we seek to promote the important work of NYC Council – contact: david at ppolitics.org, @ppolitics & @nyccouncilmatic on Twitter.